The above "Before" picture doesn't do this before kitchen justice. It was a small awkward space in an area that we enlarged by removing walls to make the kitchen much more cohesive with the rest of the space. We also wanted an updated northwest feel with a twist. This "After" shot was taken from the same spot as the before shot. It is so open now that you can't imagine where the original layout was in the first place. Another "Before" shot of the small kitchen area. Which was like a horseshoe shape in the middle of the main floor. 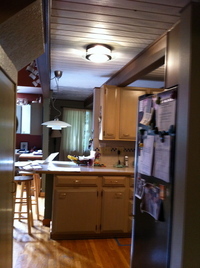 This "After" picture shows the results of removing the original kitchen walls to open up the space. Also taken from the same location as the before. To find the perfect backsplash!!! Took some doing but we found the perfect backsplash for this kitchen and the homeowner.